Google Cloud Platform (GCP) provides infrastructure, serverless products, and APIs that help you build, innovate, and scale. 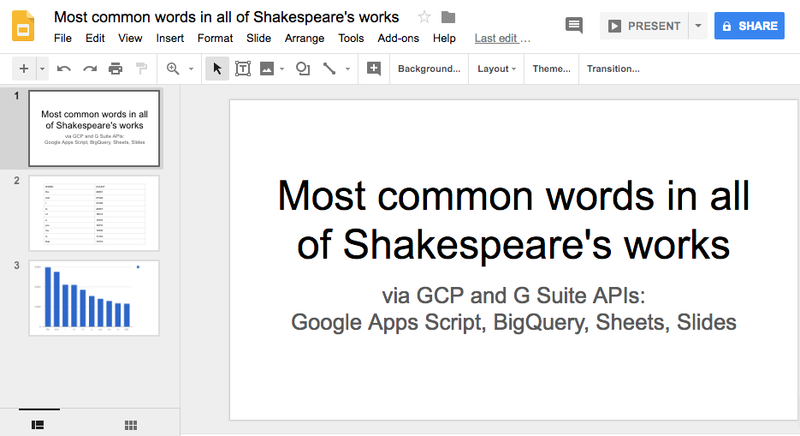 G Suite provides a collection of productivity tools, developer APIs, extensibility frameworks and low-code platforms that let you integrate with G Suite applications, data, and users. While each solution is compelling on its own, users can get more power and flexibility by leveraging both together. In the latest episode of the G Suite Dev Show, I’ll show you one example of how you can take advantage of powerful GCP tools right from G Suite applications. BigQuery, for example, can help you surface valuable insight from massive amounts of data. However, regardless of “the tech” you use, you still have to justify and present your findings to management, right? You’ve already completed the big data analysis part, so why not go that final mile and tap into G Suite for its strengths? In the sample app covered in the video, we show you how to go from big data analysis all the way to an “exec-ready” presentation. Stay tuned as more examples are coming. We hope these videos plus the codelab inspire you to build on your own ideas.